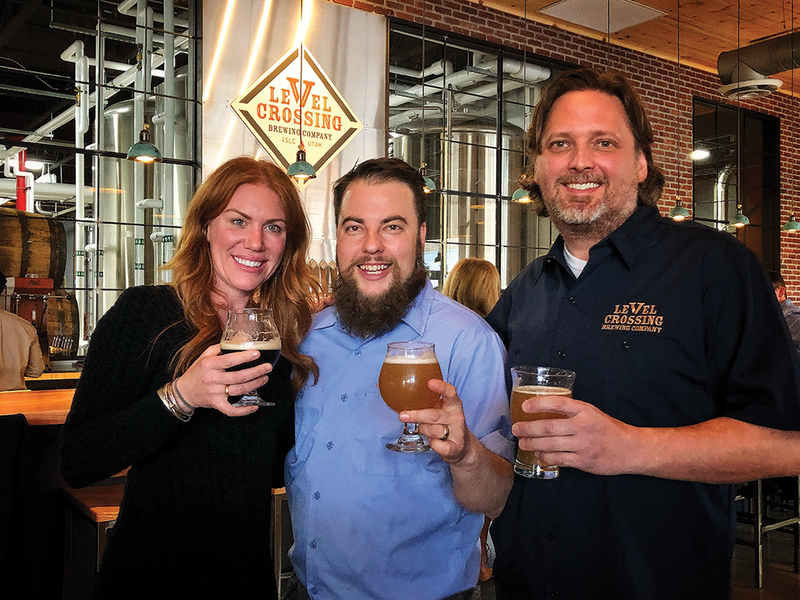 Last week, the people of Salt Lake County got yet another craft beer spot when Level Crossing Brewing Co. opened its doors to droves of thirsty Utahns. The brewery, located in South Salt Lake, is the city's third, following Shades Brewing and SaltFire Brewing Co., located just minutes away on West Temple. Level Crossing, at its core, is a highly localized brewery that will cover the gamut of local beer-lovers' wants and needs. Look for high-point and low-point beer in cans, draft beer (of course) along with barrel-aged and other trending styles. During my preview visit, Level Crossing had four beers in kegs. Here's an idea of what you can expect. Level Crossing Amber Ale: This has a clear amber-colored body that yields a nice lumpy finger of foam. The aroma has some sweet, light hints of caramel coming in and out with each sniff. The taste is toasty and brings back the caramel strongly while adding a decent, yet subtle, flavoring of hops. The palate is light to medium, with nothing harsh on the tongue. Overall: This 4 percent beer is a spot-on example of the style that will appeal to nerds and novices alike. Level Crossing You-Tah Uncommon: This beer also has amber hues and pours with a short off-white head that quickly settles to a thin cap. Light aromas of corn and toast are present in the nose. The taste starts off with flavors of corn but also has notes of barley and hints of spicy rye. The hop bitterness is perceptible, and there are enough underlying hops to mask most of the cornier aspects. Overall: The beer has a good balance. It's neither too sweet from the corn nor too spicy from the rye. With its 4 percent alcohol content, this beer is very easy to drink. Level Crossing American Wheat: Pours the typical straw-colored body with a dense, puffy head. The nose expresses bready malt and cereal. Some mild hops appear in the background and then grow in intensity. Wheat malt expresses itself mostly as crackers, then it gives way to leafy and grassy hops. Toward the end, a hint of tartness from the grains smacks the tongue. The bitterness is firm, and it finishes dry and subtly tart. Nicely done! Overall: An interesting American wheat ale. Level Crossing Oat Pale Ale: This beer pours a light amber-brown color with a small one-finger head. The nose is nice enough: sweet malts, faint citrus fruits and an earthy herbal note. The taste is quite good, though. It's sweet up front with a nice balance of fruitiness and maltiness, a dry, clean palate and a dry, slightly bitter finish that's somewhat nutty; really good stuff. The mouthfeel is suitable for the style. Overall: I really love pale ales, and I'm glad there are local breweries in Utah brewing good, quality beers like this with good consistency. This may well become my local session beer of choice. Level Crossing is located at 2496 S. West Temple and offers an in-house food menu, two bars and a separate tasting room designed for tours and special beer events. Look forward to 12 tap handles that will soon be lousy with various tasty brews, along with several can offerings including a high-point rye IPA that head brewer Chris Detrick has become known for. As of this writing, three more beers have been added: Double dry-hopped versions of their pale ale and wheat ale, along with a Jack Mormon Coffee edition of the Kentucky Common. As always, cheers! How Utahns gained a meaningless 1 percent jump in alcohol content.